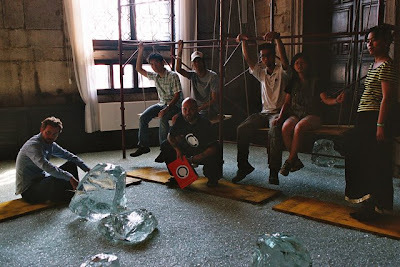 This is the third time for us to participate in the Venice Biennale. The previous ones have been in the special exhibition of the year 2000 and representing Denmark in the year 2004. Every time we have brought in Venice a garden. The “60 Minute Man” / 2000 was an oak garden in an abandoned barge on top of composted human waste and “Post Industrial Fleet” / 2004 a bigger strategy of recycling industrial ships and urban waste in forms of floating gardens. The You-Yuan glass garden in the Taiwanese Pavilion is a spatial meditation platform for post urban rehabilitation. The outcome is a mixture of Taiwanese and Finnish interpretations of being present in the circular movement in different levels and nothingness. Basically it is a rock garden with a swing. It is also just a cultivated junkyard – all the material is recycled to form a temporary collage of meeting of material streams trusting that also the city must be a compost. 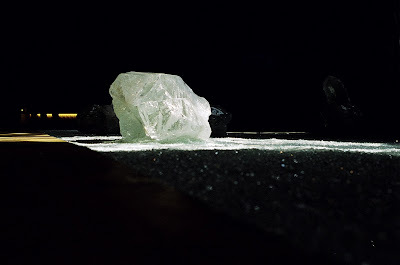 The base layer of the garden is out of crushed glass and the walkways out of sand – the origin of all glass. The bigger glass rocks are side products of glass industry – like pearls in mussels. The flat glass ovens are kept hot for 12 years for glass fabrication after which they will be cooled down for maintenance. 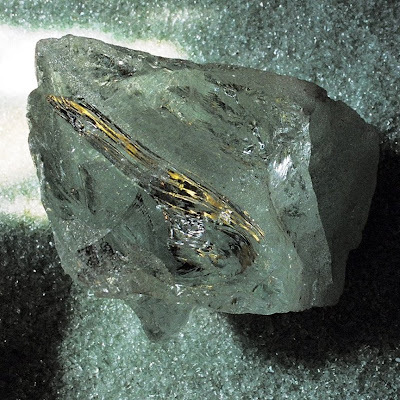 Sometimes it happens that during these 12 years the glass plasma inside the oven starts to form a stone or a rock under quite extreme heat and pressure conditions. 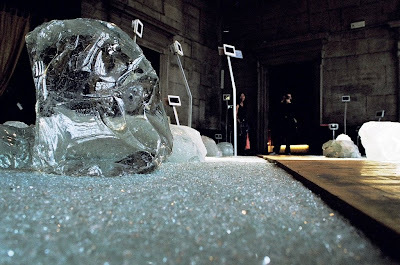 The clear glass rock is an accident – no man can make this. The swing is something that you see in almost every house in Finland. The family can sit together there and this is where you take a nap in the summers. The slow rocking rhythm, floating, human body as part of circular movement is what we all carry in our genetic memory. It is good to sit in the swing and look at the dark forest. The interviews of the Norwegian and Taiwanese urban farmers in the glass zen garden are produced by 3RW Architects from Norway. 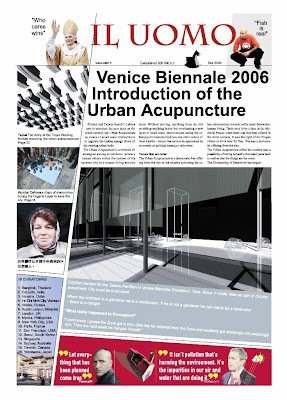 Cover of the Venice Biennale's free newspaper Il Uomo covering C-LAB's thinking and methods.